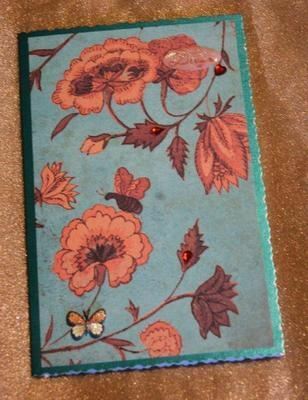 A peacock green deckle-edged card 114 x 178 mm, matted with a burnt orange and teal vintage design paper, embellished with amber gems and a tiny cream and brown butterfly. An epoxy button bearing the word 'Dream' nestles discreetly in the top right hand corner. The message on the paper insert reads 'With Love'.